Elsevier now offers a series of derivative works based on the acclaimed Meylers Side Effect of Drugs, 15th Edition. These individual volumes are grouped by specialty to benefit the practicing physician or health care clinician. The unwarranted effects of medications used in psychiatry can adversely affect a treatment plan. This book is critical in helping psychiatrists and mental health professionals assess the adverse effects of drugs such as antidepressants, mood stabilizers, hypnosedatives, and antipsychotic drugs. The material is drawn from the 15th edition of the internationally renowned encyclopedia, Meyler’s Side Effects of Drugs, and the latest volumes in the companion series, Side Effects of Drugs Annuals. Drug names have usually been designated by their recommended or proposed International Non-proprietary Names (rINN or pINN); when those are not available, clinical names have been used. In some cases, brand names have been used. This volume is critical for any health professional involved in the administration of psychiatric mediations. Dr Jeffrey K. Aronson is a consultant clinical pharmacologist and physician in the Department of Primary Health Care in the University of Oxford and a consultant physician in the Oxford Radcliffe Hospitals Trust. He has been associated with the Meyler series since 1977 and has published many research papers on adverse drug reactions. He is President of the British Pharmacological Society and serves on many committees concerned with drug therapy, including the Technology Appraisal Committee of the UK’s National Institute for Health and Clinical Excellence (NICE) and the Joint Formulary Committees of the British National Formulary and the British National Formulary for Children. This book gives a response to the increasing interest in side effects of psychiatric drugs. The association of some antipsychotics with different cardiovascular reactions, the withdrawal of certain antidepressants for security reasons, along with the possibility of better treatments for patients when side effects of medications used are known, have contributed to this interest. Meyler's Side Effects of Psychiatric Drugs is organized by sections: antidepressants, neuroleptic drugs, hypnosedatives, drugs of abuse, drugs used in Alzheimer's disease and psychological and psychiatric adverse effects of non-psychoactive drugs. For each section, there is overall and general information presenting the main features of the group and the different adverse reactions; then, there is information corresponding to the individual drugs with the same scheme. In this manner, the book is easy to use and information is easy to find. The editing is fantastic and has been performed by the expertise of Jeffrey K. Aronson, editor as well of Meyler's Side Effects of Drugs, a remarkable book whose first edition was published in 1952 and remains unique in the world for his quality and the vast amount of data included. Now, Meylers's Side Effects of Psychiatric Drugs, with advanced knowledge and the same quality and thoroughness, expands the scope of the preceding work to the field of psychiatry making this book more oriented to clinical practice. Thus, an invaluable material is delivered for psychiatrists and other clinicians interested in an update in this transcendental field. 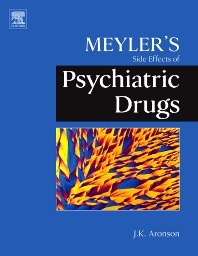 When compared to other traditional reference books such as PDF or BNF, Meylers's Side Effects of Psychiatric Drugs provides more comprehensive, evidence-based information, and a more critical approach. In summary, Meylers's Side Effects of Psychiatric Drugs is an essential tool for those who want to keep updated and to have an in-depth knowledge of the safety problems associated with drugs used in psychiatry. For several years, Aronson has edited multi-authored volumes of side effects of medications. These volumes, produced annually as the "SEDA" (Side Effects of Drugs Annuals), are the basis for this volume, which is focused on psychotropics and their side effects. Other contributing material derives from recent expositions of psychotropic medication adverse reactions. Meyler was a physician who was treated for tuberculosis at the end of World War II and who developed fever and deafness from this treatment. Meyler noted that there was no single volume that clinicians could use to determine side effects of medication, and he proceeded to publish such a book. The current text is a summary of recent findings regarding effects, side effects, and drug interactions of psychotropic medications. Meyler's Side Effects of Psychiatric Drugs is divided into 6 major sections: Antidepressants (including lithium); Neuroleptic drugs; Hypnosedatives; Drugs of Abuse; Drugs used in Alzheimer's Disease; and Psychological and Psychiatric Side Effects of Non-psychiatric Drugs. Anticonvulsant mood stabilizers are also discussed. Each section is very comprehensive regarding the clinical uses of the class of medications, the side effects to be anticipated, drug interactions, long-term effects, and effects of drug overdosage. Compounds within a class are separately noted, and medications used throughout the world are discussed. There is an excellent and useful index, and each section has an excellent and up-to-date reference list. I looked up my favorite medications and found the descriptions quite complete. I also learned quite a bit by reading the selected chapters. I think that Aronson has compiled a very useful and clinically important volume. The material is quite important for clinicians who use psychotropic medications, and I believe that Meyler's Side Effects of Psychiatric Drugs will be a useful addition to the libraries of practicing clinicians. Although the current tendency is to find drug side effects and interactions through an internet service, this volume, in its completeness and ease of use, provides much more information than one would find on the internet.